Fabulous story set in an unlikely place! Love it! Review copy received from the publisher, thank you! Enter a historic Nebraskan prison where three women find betrayal, love, and ultimate truth. Jane Prescott is serving a ten-year sentence for murder. Can a broken spirit be healed behind bars? Matron Mamie Dawson feels called to help the wounded women in her charge. Will a guard's attentions keep her from her mission? Warden's wife Ellen Sullivan has changed her preconceptions about these female prisoners. Will it be enough to save her from a life-or-death situation? 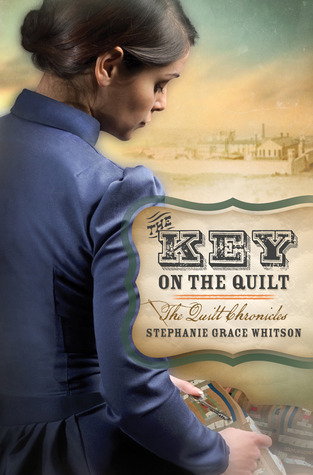 Will the cryptic quilt connecting their lives expose the truth of one woman's past and ensure a better future for them all? This was quite an unexpected adventure that centered around several people involved with a women's prison during the late 1800's. Ranging in character point of views from the warden and his wife to the prisoners, there is one woman who is the unlikely thread that weaves them all together. Jane Prescott is in prison for murdering her abusive husband, and little by little we learn more about Jane, her past and the aunt who is raising Jane's daughter. Meanwhile, Jane befriends almost everyone she comes in contact with, with her easygoing and helpful manner. She helps the other women serve their time as pleasantly as possible, while inspiring others in town as well. Meanwhile, Jane has to develop a bit of faith in herself in order to hope for the future, which at present seems dim from her cell. The other characters have their own story to tell, from Dr. Max Zimmer who seems to be Jane's only hope, to the women's matron Mamie Dawson who would like to see the prisoners succeed. To round out the cast, there are not very nice characters with fellow prisoners and guards who bring an ominous shadow of doom over them as a battle of good and evil takes place. The historical details were subtle, but the inspiring story of many facets made up for it, with its fast pace and enchanting characters in a unique setting which made this a page turner for me. There is a bit of romance, redemption and hope wrapped up in this story of Jane's journey to hell and back. I loved the entire quilt symbolism and the tie in to the daughter that Jane left behind, which leaves a great option for a sequel in my opinion. The author's writing style flowed so well for me that I immediately started looking up her other work; I can't wait to see what I've been missing. The Key on The Quilt exhibits stellar writing and is a perfect novel for those eager for an inspiring story set in a very unlikely place.